Tag with Tag8- harness technology retrieve lost valuables Founders Sanjay(l) and Alok(r) Sanjay Chakrabarti founding partner of tag8 talks to Our Frontcover about how he gave up his 18+ plus years of corporate career to take a plunge into entrepreneurship. Though it came naturally for partner Alok Sheth, Sanjay needed to introspect and give it a long hard thought. It was a balancing act but one he surely doesn’t’ regret. How did the idea of tag8 come about? Did you always want to have your own venture or did something spark off the idea? My partner Alok Sheth and I worked together in EY on several large consulting projects. Our initial entrepreneurship discussions started more as a casual discussions way back in 2010. Incidentally, the lost recovery service company was the first idea that Alok had proposed. The problem statement was evident; in today’s fast paced life, its common to lose valuables. It's what every commuter and traveller fears.Besides, what are the chances of getting anything you lose, back? Roughly, one in five people who find a wallet in the street might hand it in or try to track down the owner. The sense of loss is greater if there are memories, emotions, sentiments, hard work associated with the valuables or the loss leaves you totally stranded, as in the case of losing a passport in a foreign country. However we decided to evaluate other options, to ensure that we aren’t short selling ourselves to beginner’s enthusiasm. It took us almost till end of 2013 to finally take the plunge. Can’t put my finger on it, but just overnight we almost miraculously knew that this is the business idea that we would like to own. Post that day, there was no looking back. We both formally resigned in mid 2014 and spent the balance months in juggling between polishing our business proposition and completing our professional commitments. In January 2015 we took the entrepreneurial plunge. Tell us about your corporate career before tag8? Was it an easy decision to switch to being an entrepreneur? I am a Charted Accountant. started my consulting career with Arthur Andersen, which later merged with EY in India. I spent over 18 years with EY/ Arthur Andersen,at the time I resigned from the EY partnership, I was the National Clean Technology Leader and the Market Leader for the Industries, Infrastructure & Consumer business vertical. Alok is an Engineer and MBA by profession with over 13 years of management consulting experience. Alok’s domain of expertise is strategy, operations and supply chain. Alok comes from a family of entrepreneurs, while in my family I am now the first to take an entrepreneurial plunge. For Alok it was more a natural progression, while for me it was a huge decision. Apart from the financial aspect, the very thought of moving out of ones comfort zone was a key barrier. There was also the process of getting the entire family’s buy in, into the decision. The one advice that I had got that has helped a lot is that when moving into entrepreneurship, one needs to try and ensure that there is no compromise in the overall standard of living. In fact one must plan to look at an improved standard of living to ensure that the initial stress of entrepreneurship is not passed on to the personal life. Explain to us the concept of tag8 tag8 is India’s first comprehensive lost & found services company. 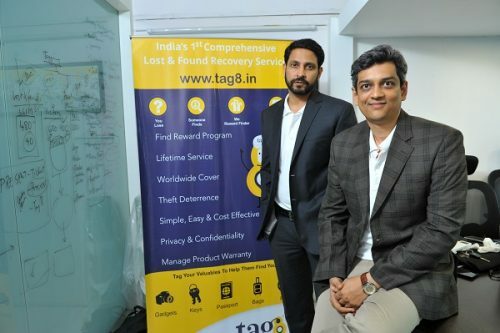 tag8’s technology-enabled tagging harnesses the power of internet, mobile application, tracking technology, digital maps and reward program to offer solutions for facilitating tracking and returning lost valuables, enabling Warranty Management. The process works in 2 easy steps ie. attaching the tags to your valuables and registering them with tag8. On receiving intimation of your lost valuable being found, tag8 manages the rest for you, from coordinating with the finder anywhere in the world, managing logistics of return to rewarding the finder. The “How it works” video can be viewed on www.tag8.in. What were your main hurdles with tag8 so far? Coming in from a global consulting background, wherein the entire infrastructure support is a given, to start a business from the scratch, right from locating and furnishing an office to putting in the minutest infrastructure together yourself, is a big change. However, the excitement of starting a new journey and the prospects around it, makes it fairly easy to overcome the challenges. Your proudest moment till date and the biggest achievement so far. Frankly, getting the first customer to buy our product off the shelves was a very gratifying moment. On the formal front, getting the HDFC Digital Innovation Award, 2017, that had participants from around the globe, was certainly a happy moment for team tag8. Tell us about your target customer? Travellers/ people on the move are our biggest business segment. We are rapidly increasing our distribution channels to reach as many customers as possible. On the retail space, we are available on all airport stores of Shoppers Stop. Online, we are available on Amazon, Flipkart and also sell directly through our own store at www.tag8.in. We also have corporate tie ups with major companies such as ICICI Lombard, Eternity LIfetsyles, EY, among others. We are secure corporate assets of Vodafone, Mahindra Susten, CarDekho, HOousing.com, Omniactive, Indofil, among others. Till date, we have sold over 0.6 million tags. Encouraged by the customer feedback, we plan to focus significantly in the retail space. Our products will soon be available in select premier retail stores, including the Bangalore Duty free. We see this as a stepping stone to our short term goal of being available in duty free stores in select US and European destinations. On the corporate front, we are in advance stages of discussions with several of the large players in the travel space. We also have some interesting innovative solutions that we are currently exploring with a few large insurance companies. Our products also fit well in the corporate gifting space. This is a segment that we haven’t explored much and hope to do so in this quarter. On funding, we are currently boot strapped and profit making. We do not have an immediate plans of fund raising. Our target is to reach 2 million tags by end of this financial year. Lots being said about India being the right place for start –ups/entrepreneurs. Is it really all that rosy or there is still a lot that needs to be done. Any advice for the start ups? India is indeed shaping up well in the start-up space. It has a thriving and extremely well connected and helpful start-up community. Further, there is an increased openness in the Indian corporate world to collaborate with start-ups. However, the statutory compliance requirements continues to be the single biggest challenge for all startups. There are several start-up programs that have bene introduced by the Indian Government, however even to be qualify under the programs is a long drawn and cumbersome process for a startup that needs to work within a limited resource. Where do you want to be 5 years down the line? ( It’s said the most difficult phase is surviving the first 5 yrs for any start up) We have set our sight to be the biggest lost & found recovery services company in the globe in the next 5 years. Our current biggest global compete is touching 40 million tags. tag8 boasts of Hassle-free claims, warranty alerts and is simple, easy and cost-effective.